Now users of Windows Mail can easily convert emails from Windows Mail to Outlook .pst format with complete details of Windows Mail emails. With this software you can easily convert huge bundles of emails to PST format. Slow performance of MS Outlook or MS Outlook become not responding, May be the reason is heavy Outlook PST file. Shrink PST File shrink heavy weighted PST File using highly advance Outlook PST shrink utility and campatible with Outlook 2000/2002/XP. Convert MBOX files created with AppleMail, Entourage, Eudora, Postbox, Netscape, PocoMail, Thunderbird, Spicebird, Opera, PowerMail, Claws Mail, Evolution, SeaMonkey, Sylpheed, Mulberry, GyazMail, Gnu, Sparrow, and The Bat! email clients in PST file. 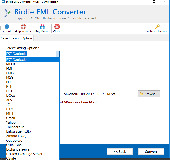 Convert EML files to PST program becomes helpful to several users who want to convert emails into Outlook .pst while preserving all email properties during conversion. During the process of conversion you will avail batch conversion benefit.